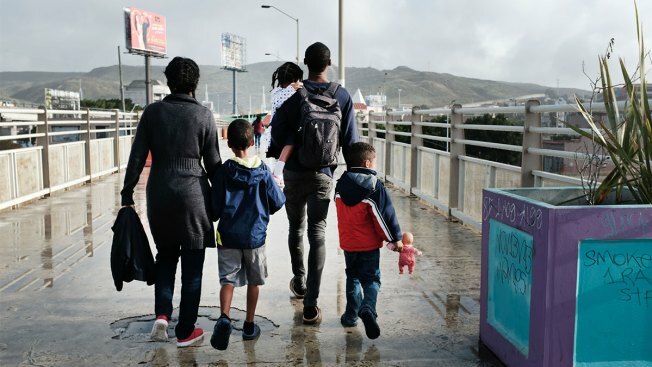 A migrant family walks across a bridge on Jan. 18, 2019, in Tijuana, Mexico. The Trump administration plans to begin turning asylum-seekers back across the southern border on Friday to wait in Mexico under a new policy designed to crack down on immigration by Central American families, according to three Department of Homeland Security officials familiar with the matter. Customs and Border Protection officers will begin returning asylum-seekers trying to enter at the San Ysidro port of entry in California from Tijuana, Mexico, where thousands of migrants from Honduras, Guatemala and El Salvador are already waiting in poor conditions, NBC News reported.